You can’t manage time. It’s like trying to manage your cat: a frustrating and consistently unsuccessful activity. Time passes regardless of how important or trivial whatever you are doing is. The sea ebbs and flows, the wind blows, and time passes. All are unmanageable and completely disinterested in our minutiae. What you can manage is yourself and your choice of what to do. So time management has always seemed something of a daft name for our efforts to be more effective. Self-management might be more apt. But time is a useful way of measuring our focus and energy on tasks. Or indeed the time we spend not doing things. It is, however, nothing more than useful; it’s not the whole story. That’s because we can’t measure the value of our activities over a given period of time. The value of what we are doing has a much bigger impact on our success than how long it took to do. So that’s the first and biggest secret of time management – decide what’s important. Because unless you know what’s important and what’s not, you don’t know where best to spend your time. Or to say it another way, you won’t know how best to spend your life. Most people have dreams, ideas and ambitions that they hope they will achieve one day. I’m no exception and I doubt you are either. The only trouble with dreams is that it’s a little tricky turning them in reality. Our ambitious dreams often get trodden on by the little sceptic at the back of our minds who tells us we can't do whatever it is. And too often we listen to the sceptic in us, instead of the dreamer. Randy Pausch, who was Professor of computer science at Carnegie Mellon, USA until he died in 2008, once wrote “Get tenure” on his to do list. He laughed about it and said it was probably naive to write such a big thing on a To Do list. He said should have broken it down into smaller chunks. Maybe he was right, but he did become a Professor at Carnegie Mellon and did turn his dream into a reality. His book “The Last Lecture” talks a lot about achieving dreams and is well worth a read. There is a nugget of an idea here, though. If we were to put our dreams onto our To Do lists, we might start doing more to achieve them. We might start breaking them down into smaller tasks, and get on and do something about them. Because unless we start doing something, we will definitely NOT achieve our dreams - that much is certain. Just about every time management course I’ve ever been on, and I’ve attended a few, has always asked the same question. What did you do today to achieve your most important goals? What have you done this week, or this month? Sadly, many people admit they haven’t done anything in a long time. Many people admit they forget, for long periods of time, about their dreams and ambitions. It’s worth more than a passing thought as we jot down what we intend to do today. You probably know other types of tiredness at work. It’s a universal problem. No matter how many books get bought on Time Management, it’s a simple fact of life that we get tired and work gets a lot more difficult. So how can we be productive when dog-tired? As Philip Pullman once said – “A bad day’s work is a lot better than no day’s work at all”. Work on your To Do List – and prioritise it. Make sure everything you need to do is written down and then decide what needs to be done next. The act of sorting out what needs to be done, and in what order, is motivating in itself, and more often than not prompts thought and action on the task. Set your stop watch to 15 minutes and work on your Most Important Task. Just 15 minutes, even if you work slowly. Getting started on a task, even a little bit, moves things forward and will make the next 15 minutes easier to do. If you can, take a nap. Even a short nap can make a huge difference in your productivity and might make the difference between a decent day’s work, or a totally wasted day. Work on routine admin stuff, like expenses, filing, accounts or something that doesn’t take too much brain power. I often that I can get quite engrossed in little tasks, and get quite a lot done despite initial tiredness. Track your time. You are most likely to waste time by web surfing, reading the paper or generally wasting time when you are tired. And most likely to lose track of time when you are tired. We do it without thinking, or realising how much time has gone. If you track your time then at least you get reminded where the time is going, and can use another technique to try and get back on track. Learn something new. Reading is productive, and a good way to learn about important but not urgent things. So if you’ve been meaning to learn a new software package, or get up to date on industry trends, tired time might be perfect timing. Give yourself a deadline. Not having a deadline for tasks can be a huge problem – when everything is urgent, but nothing absolutely has to be done today. Work ahead and figure out deadlines for mini-tasks and work in hour long chunks, tracking your productive time in each hour. Work with someone else. Hold a meeting, a telecom or something that requires interaction with someone else. It’s amazing how you perk up when reacting to someone else’s ideas and views. Just be careful not to waste someone else’s time in the process of trying to rescue your own day. I like holding meetings at the end of the day because it helps everyone keep going a bit longer, and the ideas are just as relevant. Work on something you love. It’s always easier to work on something that naturally inspires you. It may be better to get something done in an area that flows easily during tired time, and work on more difficult things when you are fresh. Remind yourself of your ultimate goals. Not giving in to tiredness is difficult, and often the only way to do it is remind yourself why you do what you do, and why you love it. It’s easier to motivate a tired brain when you know why it’s worthwhile. What are your top tips for working when tired? I’d love to hear them. And I promise not to disappear for such a long time again! In theory, customers would be at the heart of every business. In practice, there’s a real tension that between business interests and customer needs and wants. All customers want great quality, service, and functionality at the lowest possible price, but businesses exist to deliver a return to their shareholders. So although most businesses start out with a focus on customer needs, bit by bit their attention shifts to profitability, operational efficiency, what their competitors are doing, etc, etc, etc. Over time they become less customer-centric and more company-centric or competitor-centric. The rub, of course, is that for every business that does not pay close attention to customer needs, there is a competitor who does. And no matter how efficient a business is, unless it produces what customers want to buy it will not be successful over the long term. Businesses that recognise and respect that tension, however, improve their profitability by adopting a customer centric strategy. By looking at every problem or opportunity from the point of view of the customer, the business gains new market insights and is better able to compete. They remember that the customer always has a choice. Today’s renewed focus on being customer-centric is due to globalization and the internet, and the increased choice that customers now have as a result. Power has shifted away from the salesperson having all the knowledge, to the customer. An hour’s desk research now produces a list of suppliers in any given market, as well as a host of unbiased, real-life consumer reviews of how well the company or product performed when used in anger. When customers make an important purchase, they can spend as much time as they want researching their options and are quite likely to know more about it than any salesperson. The company that wins their business will offer the best value for their particular situation – whether they are looking long term or short term, whether they want something cheap and cheerful, or something they expect will last a lifetime. So being customer centric means putting the customer at the heart of decision making and planning; being aware of different customer needs, and catering to a specific segment. Apple has done this to stunning and profitable affect. There’s nothing like a blog post on measurement to get comments flying. It is as though in business “To Measure” or “Not To Measure” is an either/or. Of course it isn’t! Both qualitative and quantitative aspects of management and leadership can and must live happily side by side. It was Tom Peters, the indefatigable business guru who inspired this blog, who reminded me of the importance of measuring the important stuff in business. I recently came across one of his essays from 1986 entitled “What Gets Measured Gets Done”. In his tireless campaign to improve customer service, improve efficiency and generally shake up business people everywhere he advocates measuring our promises to improve. Then holding ourselves accountable – weekly – with our peers. He suggests starting out by quantifying 10 areas that are fundamental to success: sound advice which just happens to work. As regular readers will know I have been moaning about my weight for far too long. I keep meaning to do something about it, and then nothing happens. Well measurement turns out to be the answer. By rigorously measuring my calorie intake on a daily basis at last I’m beginning to see results, even though my running has taken a bit of a back seat recently. And I’m still eating everything I enjoy, admittedly in smaller quantities. This isn't rocket science, but neither is it the Atkins diet, the cabbage soup diet or even the Dukan diet. It's the measurement diet. And it works astonishingly well, without buying a single book, DVD or branded kitchen scales. Peters recommends regularly celebrating small successes, a Danish pastry for meeting a project milestone or whatever. It’s nothing more complex than carrot and stick, or positive reinforcement, but it has a dramatic and hugely beneficial effect. I'm looking forward to my slap up meal for losing a stone! And just in case you can’t find the article when you type “What Gets Measured Gets Done” into Google, here’s a link to the essay: http://www.tompeters.com/col_entries.php?note=005143&year=1986. Tidying up is a thoroughly therapeutic task. Organising something that was previously chaotic has so many benefits, quite apart from the calming effect on the soul. My kitchen cupboards recently unattached themselves from the wall thanks to an over-enthusiastic washing machine. Rather than have their precious contents become part of an insurance claim, I emptied the cupboards. This was not only hard work (who would have thought kitchen cupboard could hold so much?) but also revealing. I found ingredients that had been bought twice (a surprising number), ingredients that should maybe be eaten up (nothing earlier than 2009, but even so …) and bottles that had never been opened (but will be now). In short, I had only a vague idea of what was in my cupboards. And I only moved three years ago! Although kitchen structural defects are not to be recommended to anyone, I have found the act of clearing out, cleaning up, and re-organising to be extremely valuable. I have reassessed what I really need, what is only used occasionally or not at all. 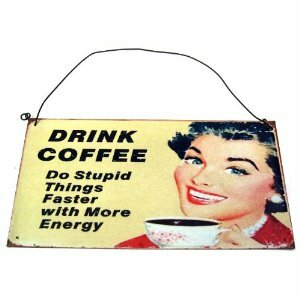 And I have resolved to simplify: which should save money, save space, and improve efficiency. Transferring the same ideas to work is even more worthwhile. Although my hard-disk is unlikely to fall off its perch due to too much data, a spring clean and re-evaluation of what’s important yields similar benefits. Pruning projects has even more value than throwing out duplicate ingredients. The CRM database is next …. So, it’s Summer Cleaning for me! It doesn’t have the same ring to it as Spring Cleaning, but it has all the lemon-scented benefits. A number of different incidents recently have made me aware of the importance of listening. Oddly enough, the brighter and more competent the person, the more likely they are to believe they are right and don’t need to listen to other views. Yet in so many cases, being right isn’t what gets results. What gets results is ensuring that everyone is in agreement with the plan: even if it’s not the very best possible plan. The reason for this will be obvious to anyone who has ever worked on a team. If only one member of the team doesn’t believe in what’s being done, they can stop or slow the whole process. Yet a team where everyone is agreed is pretty much unbeatable: even if they are not as talented as the divided team. Jim Collins’ influential book “Good to Great” has much to say on how seemingly quiet, experienced leaders are more effective than their showy, high profile counterparts. Collins lists a number of qualities of a great leader, and among them are “confronting the brutal facts” because unless you know the extent of the problem, and the reasons for why things are as they are, nothing can be changed. It is seemingly obvious, yet we can be strangely reluctant in wanting to know the truth. Humility is also listed by Collins as desirable in an effective leader. Whilst Collins’ research was not statistically valid – I’m sure there are exceptions to every “rule” – his observations are interesting. Putting people first, being humble enough to know when you are wrong, and having the patience to listen what is actually going on, instead of what you think is going on, are foundation stones to making things happen. Deciding what we want is difficult, for the simple reason that there are so many things to want. And if we want too many different things, we end up with nothing. Which is why so often we end up break New Year Resolutions, or other fine goals we set ourselves. It’s not that we don’t want whatever it is (being thin/rich/a good dancer) that we resolve to achieve, it’s just that we don’t want to give up other things that we want even more. So setting goals and objectives is mostly about making difficult choices. But if we are clear about what we want, and we want it badly enough, very often we become unstoppable – whatever the goal. “Decide what you want, decide what you are willing to exchange for it. Establish your priorities, and go to work”. It’s not only good advice, but succinctly put. And I don’t think its overstating it to say that it’s the secret (if indeed there is a secret) to success. Being clear about your goals is central to achieving excellence. But it’s also one of the most challenging aspects. Which is perhaps why there are many ballet dancers, but only one Darcy Bussell, many runners but only one Paula Radcliffe, many business people but only one Bill Gates, many investors, but only one Warren Buffett …. Yes, of course, all these people have talent. But all of them challenged their focus, their time, their energies on achieving their single most important goal. Shakespeare’s words ring as true today as the day he wrote them. If we are not true to ourselves, we will forever follow the direction of the wind. But how well do we actually understand ourselves? Apparently I wasn’t the only one who didn’t come with a manual. We all go through life trying to figure out what we like, what we don’t like, what makes us happy, and what doesn’t. What are we good at, and what just doesn’t fit with our temperament. It’s a slow and sometimes torturous journey with many twists and turns and a fair number of false starts. But as we grow as people, so our understanding of who we are also grows. Or at least it grows somewhere in the back of our minds, in our subconscious. It’s rare that we step back and take a good hard look at ourselves. But when we do look at ourselves, we find patterns that repeat themselves. I make sense of the world through words – writing and reading. It’s how I am. You may make sense of the world through numbers. Others may be visual. There’s a big difference in these different types, and it moulds our careers and what we do when we want to relax. So would our lives be different if we DID come with a manual? I think they might. Knowing whether we should put diesel or petrol into the car means our cars last much longer. If we just kept trying one and then the other, murmuring, “No, I think it went better with the petrol” we probably would never have built motorways. Yet still we insist on eating foods that don’t agree with us, we don’t take enough exercise, and we don’t really understand our strengths and weaknesses. Of course the fact that a manual didn’t arrive in the package when we were born doesn’t stop us creating our own. It might take a few drafts to get to something that seems to work, but it might be a big improvement on having no manual at all. Goals mostly focus on outcomes: winning business, running marathons in a certain time, achieving a certain outcome in a meeting, etc. But these goals rely on a host of external events: customers wanting to implement a solution when you have the staff available, being fit to run, or other people agreeing with your views. To a large degree we have little influence over these external factors. What we do have control over is the process. The quality of our proposals, the amount of training we do, being open and fair in meetings. Focusing on the process is what really gives us the advantage. Yet when we are focused on the goal we can sometimes forget the importance of each of the tiny steps along the way. Managing time, creating opportunities, being thorough in preparation all add strength to whatever goal we are trying to achieve. Gretchen Rubin in her wonderful Happiness Project blog has written some wise words about paradoxes. Sometimes to achieve the outcome, we have to focus on the process and forget about the goal. Setting a goal a full year ahead is always satisfying. There’s plenty of time to do what needs to be done, and a nice warm feeling of having something to aim for. But as the weeks and months tick by, the reality of doing the work sets in: quickly followed by growing panic as the deadline looms. One very short year ago I set myself the challenge of running a half marathon. The Reading Half Marathon, to be precise, which I ran last Sunday. At least I ran most of it, my feet and ankles complained bitterly towards the end which slowed me to a walking pace. I took 7 minutes off my Henley Half Marathon time, and wasn’t last! Yeah!!! And I achieved my goal - even though I wasn’t nearly as well prepared as I could have been, or as I would have liked. A year ago I struggled to run one mile, let along 13. I was very nervous of joining my local 3 mile Saturday morning Park Run. So although I don’t yet have the Kenyan runners quaking in their running shoes, I’ve made a lot of progress. As always with projects, be they running, software or other changes, things never turn out as you expect. I thought if I took up running my excess weight would drop off me automatically, whatever I ate. I have to tell you that ain’t so. I thought I’d have two running buddies to keep me company, for all sorts of reasons that didn’t work out either (although one volunteered as a marshal on race day and sent me off and welcomed me back with a bright, encouraging smile). I thought running would be easy. It isn’t. Reading Half Marathon was run on the same day as the New York City Half Marathon. Over 16,000 runners took part, compared to about 10,000 in New York. Our fastest runner was Simon Kasimili from Kenya at 1 hour, 3 minutes and 8 seconds. New York was won by Mo Farah from Great Britain in 1 hour 23 seconds. Both deeply impressive and scarily fast. There’s a big difference between the best and the rest. Time management is a long established but curious management idea. Time, after all, is a measurement like length or depth or height. Just like physical dimensions, we can fill it with things. So a mile along a street might be filled with houses, an hour can be filled with events. Events such as the ticking of the clock, the writing of a report, or the watching of a TV programme. Or sleeping, or eating lunch, or having an argument. Or planning the following day’s work, or taking a nap, or doing nothing (a tricky one). So time management isn’t so much the management of time, which will pass no matter what we do, but the management of the events that fill our time. Of course not all events can be managed. There is nothing we can do about a colleague coming in to work in a lousy mood. We can’t control the Porsche trying to overtake just before a bend, nor the weather. But we can attempt to manage the events that are important to us. Our choice of “events” or “things to do” during each hour is what determines the course of our businesses, our careers, and our lives. Just as what we choose NOT to do during each hour has the same (but less obvious) effect. If we think of ourselves as master builders, coming to work each day to build houses, hotels or mansions on our day-long streets, we get more of a physical picture of what we are doing. We are building little houses along our days. Some days we barely manage to complete the foundations for a rickety garden shed, other days we map out grand plans for palatial extensions. As you start your day, have a look down the street you are currently working on and inspect yesterday’s building work. Was it done according to the architect’s plans? Are you happy with the quality of the workmanship? Are other builders briefed so that tomorrow’s work can start on time? Are you almost ready to start roofing work or have you been labouring on the foundations for far too long? Most of us manage a multitude of projects, and it can be helpful to think of abstract notions such as time, reports or software as physical things. Time as a street that we are about to walk, and our day’s work as the buildings we are constructing. Concepts such as foundations, levels, and rooms, are useful for many different types of work, whether they are tangible or intangible. Happy building! Good decision making is crucial for a happy life and building successful businesses. So how do we guard against poor decisions? Whilst some bad decisions are just annoying, others can have truly dreadful consequences. So why, when often others can see a mistake is being made, do people sometimes bash on so determinedly? The answers make uncomfortable reading. Uncomfortable because I recognise them in my decision making, and I bet you will recognise them too. Just knowing this list, however, helps us make better decisions. When we recognise them, we can double-check ourselves. Intuition. Generally, we have a great belief in something we call gut feel or having a “nose” for something. But good decisions are rarely, if ever, made on intuition. Good decisions are based on evidence and data, in many different forms. Emotion. We get overly engaged with our decisions. Somehow if someone is challenging our decision we thinking they are also challenging us as a person, our judgement and our very worth. And isn’t it just true that the more emotionally involved we are, the more certain we are that we are making an objective decision? Emotion is the second sign of danger when it comes to good decision making. Attachment. Attachment is when we care more for people or things more than we care about whether a decision is right or wrong. We rationalise why we are right, knowing in our hearts that we are really attached to something that we may not want to even articulate. Self-interest. Making a decision based on what’s in it for us. More money, more power, more kudos as a leader. Bigger, better, more beautiful. More, more, more. There are too many examples of where greed and self-interest have led to disastrous decisions. Self-interest does nothing for clear headed decisions. All four traits lead us into subjective decision making, rather than objective decision making. Of course that’s not to say that buying the pretty, but dilapidated old cottage, isn’t the right decision for example. But our objectivity should at least enable us to realistically budget for renovations instead of potentially making an expensive mistake. It’s too rare these days that I make time to catch up with friends. But the other night I went out with my wonderfully glamorous and deeply French friend. She’s huge fun and annoyingly thin. But then she is French. 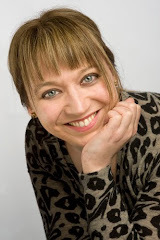 So, she asked, you are still writing the blog? There was a feint raise of the perfectly plucked eyebrow and small surprise in her voice. Of course, I returned. But of course isn’t of course. Keeping something going is difficult. After the first flush of excitement it gets harder to keep on keeping on. Which I guess is why you see so many deserted blogs. So much “space debris” cluttering up the internet with well-meaning but ultimately useless resolutions. “I’m going to write 200 words a day” claimed one blog. They managed about 300 words in total, and that was about two years ago. Seemingly the public outing of their intentions wasn’t enough. As I look down my “to do” list, the small urgent things get done. But the big, difficult things require a more disciplined and longer term approach. And a lot of keeping on keeping on to see them through. Which would you prefer? That people think of you as being intelligence, talented and bright? Or methodical, disciplined and thorough? Yet intelligence is a curious quality. Intuitively know when we meet an intelligent person. We don’t need to ask them to do tests, or perform calculations. Somehow we can see intelligence in their eyes and hear it in what they say. However, we struggle to explain what we mean by intelligence. Like a fine wine or great art, we know it when we see it. (Of course, schools and universities test for a certain type of intelligence with examinations, but history has demonstrated that many intelligent and capable people have little aptitude for passing exams). But what about the methodical, disciplined and thorough lot? The well-organised brigade who can always find things and have the right information to hand? Even though the two are not mutually exclusive, and many intelligent people are also disciplined and methodical, it is not their organisational abilities that grab the headlines. A visit to the war cabinet rooms in London this week made me think about the complex nature of intelligence, and what is required to outsmart the competition (whether in war or in business). Churchill’s brilliance (although he famously struggled with exams) and the military’s great organisational abilities, were clearly on show. Maps lined almost every wall covered with pins and wool showing enemy locations and manoeuvres. Graphs and carefully stencilled statistics were also pinned to the walls; not hidden away in ring binders. Military Intelligence has come to mean information and data rather than thinking ability. When the stakes are as high as the independence of a nation, it’s interesting to reflect on whether it was the intelligent, talented and bright bunch who carried the day. Or the methodical, disciplined and thorough crew. With five very short weeks before the Reading Half Marathon, I met up with my (virtual) running buddy on Saturday to compare notes. I say virtual, because it has been almost a year since we met in person – even though we’ve exchanged many email excuses for why we couldn’t make a running session! We both bemoaned a whole number of well thought out and credible excuses – including injuries and some big life changing stuff that got thrown at us. But the fact remains that during a full year, neither of us lost any weight, neither of us is as fit as we should be, and neither of us feels prepared for this half marathon. That’s despite a year of so-called preparation. Wow – how could that have happened? Running isn’t a substitute for eating well. I have to eat sensibly if I want to lose weight – running won’t melt excess weight away. I hate to say it, but I think this might be an age thing. To get better at running I have to show up: at practice, on a Saturday morning, for races, for training runs. A great coach helps a lot. Providing I show up on a Wednesday…. thanks Tom! Having a committed running buddy helps a lot. Doing it together is always easier; thanks Jacqui! Get the right kit. Running shoes that don’t rub, light-weight jacket for the rain (how useless is it that I still won’t go running when it’s raining? ), warm weather kit, the right socks, a calibrated distance measurer (and I thought it was a cheap sport!!!). It takes time and patience to form a new running habit; to lose weight, to get fitter, to build up stamina, to get to like (ha ha!) running. Looking back at my notes before the Henley half marathon, I weighed 5 kilos less, and was running a 5K distance 5 minutes faster than I’m running it right now. Crumbs, that’s a bit of a wakeup call. Time to put those lessons into practice! Despite dropping too many hints to everyone I know and I few people I do not, no one bought me Mad Men Series 1-3 for Christmas. A disappointment that could only be rectified by an overnight Amazon Prime delivery. Needs must (sigh). The 1950’s would have been as shocked by Amazon as we are at their bad boy attitudes. The opening episode saw the heart-stoppingly suave Don Draper fretting about cigarette advertising. Readers Digest say that cigarettes might be bad for you. His Lucky Strike executives are coming in for a creative meeting. He has no idea what to do. Draper is in a fix. He does two things that are instructive. Firstly, he talks to people about smoking; anyone, anywhere. Because he is Don Draper and he spends a lot of time in bars, he talks to the waiter who offers low-key but pertinent insights. Secondly, he talks to his scary research lady about her scary research. In the meeting, when the client turns to hear his brilliant ideas, he still hasn’t got a clue what to suggest. He thinks the research is stupid, and the problem insolvable. Why would anyone buy something that might harm them? Of course, we know the answer to the conundrum. People don’t care that cigarettes are dangerous. They just want to enjoy one of life’s pleasures; which Draper figures out just in time to keep the account. He lets every other cigarette be dangerous - Lucky Strike is the one that contains “toasted tobacco”. As it turns out, the research was absolutely right and what Draper had discarded turned out to be the key to unlocking his creativity. Although Mad Men is fiction (or is it?) it is based on (some) real people and very real advertising and marketing issues. Which is perhaps what makes it so watchable. Many great advertising and marketing people have pointed out that you need to understand both your product and your market in order to come up with a compelling proposition. Draper makes it look easy, Ogilvy admitted it was hard work and tedious. Both knew it was necessary. Does a ruler set your heart racing? Would a new protractor make you feel a little giddy? Did you go into maths lessons with a hop, skip and jump when you were at school? No? Well me neither, but that doesn’t mean to say that measurement isn’t one of the most important aspects of the highly sophisticated lives we live. Lord Kelvin pointed out that “If you can’t measure it, you can’t improve it”. Those carefully chosen words seem self-evident to me, yet measurement is not something we accept naturally. Much human communication is though words, expression, tone or voice, touch and emotion – all of which are difficult to measure. But all great advances in human endeavours have come about through our ability to measure things. The list is very long: healthcare, safety, architecture, transport, energy efficiency, food quality, and much more. A couple of weeks ago I went to see what might be the world’s oldest clock, which could date from the 14th century. It currently stands in the magnificent Salisbury Cathedral which is well worth a visit even if you have no interest in early time pieces. Of course in the 14th century, and many years afterwards, accurate timekeeping was not possible. If you don’t know what time it is, you cannot co-ordinate people or events around you or across town. Nor do you know how long things take to do (like cook a soft-boiled egg or travel to Leeds). Whilst it is interesting to look back at advances in measurement and understand the benefits they have brought, it’s also interesting to think about the things we can’t or don’t measure. Of course that list is a great deal longer than the many things we already measure. From my limited experiments with measuring time spent on different activities (focused work, day dreaming, wandering around) or the number of data-driven decisions we make in a day (not many), I concluded that it is possible to usefully measure more than we currently do, even though it is difficult and somewhat unnatural. Benjamin Franklin famously tried to measure thirteen things that he considered important: silence, order, resolution, frugality, industry, sincerity, etc. He tracked his adherence to these virtues at least until he was 79 when he wrote about them, and resolved to follow them longer as they had brought him so much happiness. None of them are concepts that lend themselves easily to measurement. Yet if Franklin hadn’t measured his adherence to them, he would probably have forgotten them long before his 21st birthday. Bernard Shaw once said that all progress depends on the unreasonable man. I suggest he was wrong; progress belongs to the man with a mind to measure. Benchmarking might appear to be a pretty academic concept, yet it’s amazing how much we use it at work and at home. Are you happy with what you are paid? Having a rough idea of the national average or how much people earn in our line of business makes a difference: so much of a difference that this benchmark affects how happy we are with our work. What time do you set your alarm for in the morning? Knowing that you will function well on 8 hours sleep affects your attitude and demeanour the following day. A daily benchmark we use without even thinking about it. How many hours a day do your colleagues work? Having a rough idea also affects how satisfied you are with the number of hours you have to put in to get your work done. Benchmarks are everywhere, even though they don’t have that label. I was looking up how many telephone calls professional telesales people make a day. 100 calls a day gets bandied about on forums that discuss this sort of thing. 100 calls a day! Wow! That’s a huge number. Well it might seem that way to me, but to some it’s a normal day in the office, and they fit in other work besides. Benchmarking is important because it gives us an idea of what’s possible, what’s exceptional, and what’s sub-optimal. When managing a business, that’s hugely important. Being able to measure and benchmark people’s capabilities and achievements enables everyone to reach for their best. And that’s when people are at their happiest – when they are striving for something that’s worthwhile, difficult but achievable. Benchmarking is also a way to solve problems. Once you can measure the current position, and compare that to some sort of benchmark, you can start to figure how big or small a problem you have. And even where you might look to start solving it. So keep a look out for where you are, and are not, guided by benchmarks. Some of them might surprise you. Until very recently, increasing efficiency meant creating a software system to store relevant information about part of your business. Instead of doing the job manually, or on spreadsheets, it went into a database system. Software systems improve productivity and efficiency, whether it is linked to other aspects of a company’s work (ERP) or stand-alone. It is a hugely successful approach that all businesses have embraced. The focus on these projects is the data that needs to be stored in the system. If you put the right information in, we thought, you will get the right information out. The only problem is that all the emphasis went on putting information in, and hardly any focus was on understanding the data. As the big system trends, such as accounting, CRM and ERP, are becoming more mature, we are now turning our attention to what all this information means. And increasingly we are finding that it is not as self-explanatory as we thought. Firstly, data isn’t neatly together in one place. Rather, it is in a number of different systems that were created at different times for different reasons. Secondly, traditional system reports are geared towards efficient systems, not business insight. Thankfully, a new generation of software tools is coming to the rescue. They are focussed entirely on finding meaning from existing data and are priced to be attractive to businesses of all sizes. For example, Microsoft’s SQL Server Integration Service, Analysis Services and Reporting Services are included in all versions of SQL Server from 2005 at no extra cost. This changes the nature of business competition. As well as having products and services that customers value, which you can produce cost effectively, visionary businesses are looking at their systems to find new insights and meaning within customer information. And they are using those insights to improve the value they provide to customers. Customer Intelligence is the process of improving strategic marketing decisions by joining together and analysing customer data from a company’s various different software systems. Customer data volumes are exploding. Disk space is cheap, database systems are powerful and can store many different types of data, and software applications such as accounts, CRM, ERP are holding vast amounts of customer-related data. The result? More customer data than you or your competitors have ever had before. Increased competition. Globalization has been a trend for over 100 years, but with cheaper travel and better communications it has become more pressing over recent years. The internet reduces barriers to dealing with suppliers in different countries and massively reduces costs. Consolidation in many industries has also been a competitive trend, resulting in larger and better funded competitors. Both trends are continuing in many industries. Better informed customers. High speed internet connections and low priced PCs have enabled every home and business in developed countries to be connected. When only a few years ago information was difficult to find, now Google produces highly relevant search results instantly. The increase in consumer comparison web sites puts a great deal of power in the hands of consumers. And where once content was generated by the marketing department, now it is generated by millions of bloggers, reviewers, contributors to Wikipedia and social media enthusiasts. There is no shortage of information for customers who want to know. It’s not difficult to conclude that vendors will have to work harder to attract and retain loyal customers. Yet customers have not changed. They still want value from their purchases, and they want their custom be valued. Differentiation and value are still the keys to keeping customers happy. And understanding customers is the key to figuring out what they value. Customer Intelligence is all about understanding customers; their history, their behaviour and their preferences. The information is already sitting in a million accounting, CRM or ERP systems and will yield a million different insights for the methodical marketer. So Customer Intelligence will become the number 1 issue facing marketers over the next decade. Data-centric decision making will become vital as businesses of all sizes search for ways to improve products and services. Astonishingly, most companies already own the tools needed to create these marketing insights. All they have to do is to use them. “Oh, I hate all this uncertainty!” says Rex in Toy Story 3 as the toys try to figure out what will happen to them when Andy goes to college. Despite many of us professing to feel the same way (about uncertainty, not Andy going to college) we seem to be inexplicably drawn to uncertain situations. Take the meteoric success of eBay as an example. What about the stock market? Do you know any shares? Do you follow their rise and fall, eagerly noting the gains, and trying not to get too despondent about the falls? Unit trusts are a much more sensible way to invest, but many cannot resist the idea of making a killing on the attractions of a share no one else has noticed. January is traditionally Sale time, and don’t we all just love the sales? People have been known to queue overnight outside the store to get cut-price “bargains”. Interesting …. 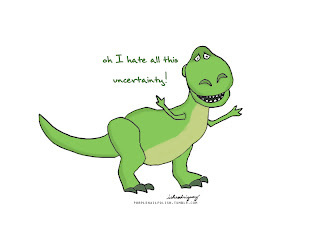 It’s hard to conclude that we hate uncertainty. Or at least that we are not prepared to get caught up with it in order to profit in some way. 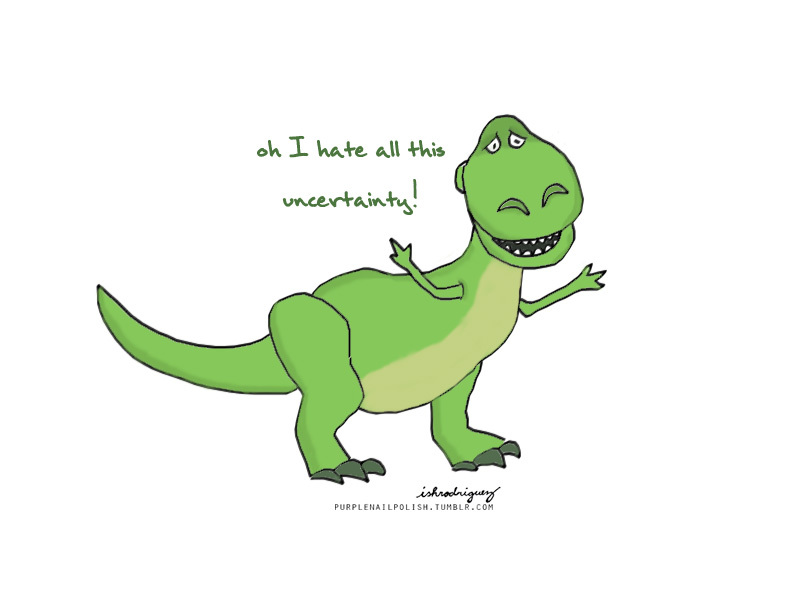 It’s a lot easier to believe that we like uncertainty, despite protestations to the contrary. Uncertainty has been used for years by marketers to give a sense of excitement or scarcity to otherwise ordinary promotions. When you stop and consider how much uncertainty adds a touch of excitement or fun to your life, it’s not difficult to see how or why this is such a potent idea. Over the Christmas break I was asked about how to improve attention to detail and proofread work so that it is error-free. It’s an interesting question and one I have given much thought to over the years. Allow time between finishing the work and proofreading. Ideally this would be several days or at least overnight, but even an hour or two will help. Allowing the brain to focus on other things allows you to come back to your work with a more detached view. Read the document several times to check for different things, eg whether it makes sense, whether it flows nicely, whether it is factually accurate, whether there are any misleading sentences, etc. Proofreading is not the same as reading through your work. We often mix up proofreading with these other activities, trying to do too many things in one reading. Separate them out to improve accuracy. Use an eye-guide such as a ruler, your finger or the cursor to check each sentence slowly and methodically. Because we are capable of reading quickly, we do. But proofreading requires us to slow down and purposefully read each word. The physical act of moving a ruler or a finger helps. Change the look of the document. Word processors enable us to very quickly change things such as the margins, font or pagination to get a different view of the text. Make the text larger to see if errors are easier to spot. Use the spell checker. This is standard in most word processors but some software requires it to be switched on. Never release a document without spell checking it. Read your work aloud. This has two benefits; firstly you “hear” errors more clearly aloud than when you are reading to yourself. Secondly, it slows down the process, also making errors easier to find. Always go back and re-check your work after you make a change. Many mistakes slip through because of last-minute changes that alter the sense or structure of a sentence. If you make a change, carefully re-check that section. Ask someone else to read your work. No book publisher would ever allow a book to be printed without several people carefully checking it. Someone else will more easily spot awkward sentences, sentences that make no sense, spellos, typos and other gremlins. Even better if you know someone who is a stickler for grammar and punctuation. Concentrate on the proofreading process. Often this “last lap” is done without the attention it deserves. We allow our minds to wander as we work. Proofreading for zero defects is strenuous and requires 100% concentration. Listen to your inner voice. Often we notice errors even though we don’t do anything about them. Grammatical errors or using the wrong word register with us on a subconscious level; listening to your inner voice at the checking stage often saves a red face later. Have good references. Using a good dictionary, a good thesaurus and style guide all help in quickly checking the correct word or phrasing. Create your own checklists. A checklist for things to check, eg grammar, style, readability, clarity, accuracy, completeness, spelling, typos, accuracy of numbers, etc. A checklist for favourite mistakes, eg words you frequently misspell or grammatical errors you make often. Every time a mistake creeps into your work, add it to the checklist so you improve next time. Create your own style guide. Each industry has its own best practice. Create a style guide that includes common company names, abbreviations used in your industry, etc. Include good examples of other people’s work. Include favourite references such as dictionaries or web sites that are useful. This is another feedback loop that helps improve writing with every piece that is published. Read your work in different ways. As authors of our work, we start at the beginning and lovingly read through every word. Readers don’t do that. They scan the title, intro and random paragraphs to see if it looks interesting. They miss bits out or skip to the part that is relevant to them. Simulate a reader’s behaviour by reading random sections, or parts you know might be read out of context. Do they make sense? Are they clear and unambiguous? Try reading backwards and focusing on each word rather than the sense. Proofread from a printout; don’t rely on working from the screen. I know it’s not ecologically sound, but moving away from the computer to a quiet place makes a big difference. You can work slower and more thoughtfully. Build proofreading time into your schedule. Nothing ruins good work like silly errors that should have been picked up long before they get to the reader. It is tempting to think they don’t matter, but readers subconsciously mistrust error-prone work. Use a professional service. I have employed a copywriter to check my work for important work and it doesn’t have to be costly. If you have a large or important document, it could be worthwhile. It’s a long list. And I’ll admit to having made each and every mistake going. Working in the software industry teaches accuracy, even if it doesn’t come easily and is an on-going struggle. But proofreading and producing zero-defect work is a process rather than a talent. Certainly some people have better attention to detail than others, but technology and checklists help. Does anyone else have any tips or techniques to share? I’m sure there are more and I’d love to hear!